October 16th is National Boss’s Day! A day to celebrate and acknowledge a great boss! Make it a memorable celebration! Arrange for a few team members to go to the office a bit early on Boss’s Day to decorate with balloons and perhaps a festive hand made sign. Then see if everyone would like to pitch in for a special Boss’s Day gift basket delivery. Give us a call and we will custom design a gift within your budget and perfect for any Boss-Anality! A free personalized imprinted ribbon banner can be included on your gift basket. 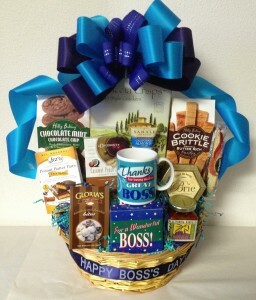 For instance it can say “Happy Boss’s Day” and include the Boss’s name. We have gifts for: The chocoholic, the sports nut, the workaholic, golf enthusiast, gardener, nature lover, baseball fan, health nut, camera buff, sailor, fisherman, skiier, movie lover and more. Great pamper baskets so she can relax and de-stress, too! Give us a call today to get on the delivery schedule, and then be ready with the camera, to capture the boss’s surprise and delight when the special gift basket arrives!